Though at first sight its large board with multiple betting options might seem somewhat intimidating and complex to a first timer, Roulette is one of the easiest popular casino games to learn and play. Before we get into advanced strategy that will allow you to impress your friends with your skills at the table, lets first get into the basics of the game and how it is played. Image Source Originating in France in the 18th century, Roulette  French for little wheel - has since remained one of the most popular casino games in the world. As you no doubt have seen in TV and movies, including the 1942 absolute classic Casablanca, Roulette has been one of the most popular mainstays of casinos across history. The game is played by placing bets on a board of numbers. Once all bets are placed, the croupier  also known as dealer  will close off the betting period and spin a small metal ball around the rim of a wheel while the carousel below it turns in the opposite direction. As the ball slows down it will fall into the carousel, which is commonly divided into slots labeled with numbers from 0 to 36, colored either red or black. Whichever numbered slot the ball eventually stops in will be the winning number. If you had placed a bet related to that number, you win! Simple, right? But before you rush off looking for your nearest casino to put your skills to test, theres still plenty for you to learn so stick around! Before we go into the types of bets you can make in Roulette, lets first go over the differences between the types of Roulette tables you will encounter. The two main variations of Roulettes are the American and the European. While they might seem quite similar to the inexperienced player, the truth is one of them has considerably superior odds for bettors, making it quite important to be able to tell them apart. Image Source Unhappy with how little the house edge was in Roulette, American casinos added a Double 0 to the wheel. The American variation has since been introduced in all parts of the world. European Roulette is the most popular type of roulette in the world, and one of the oldest games still played in casinos today. Its carousel boasts 37 slots, numbered from 0 to 36. The 0 is the only slot that is colored green, rather than red or black, and that does not belong to a particular column. This means that if the ball lands on 0, players will lose their bets to the house. Its the existence of this 0 that gives the house a slight edge over players. 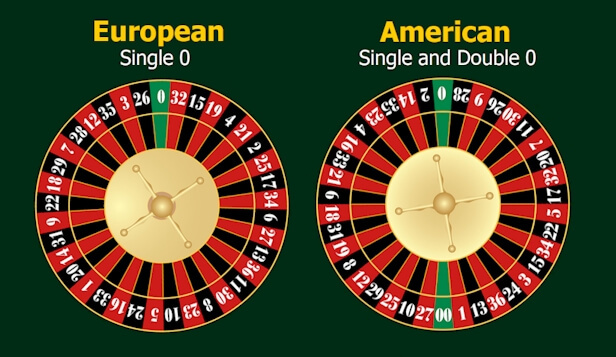 Unlike its European counterpart, American Roulette has 38 numbered slots in its carousel, adding an additional green slot: 00. Just like the 0 in European Roulette, the ball landing on 00 will lose you all your bets, doubling the advantage that the house has over the players. 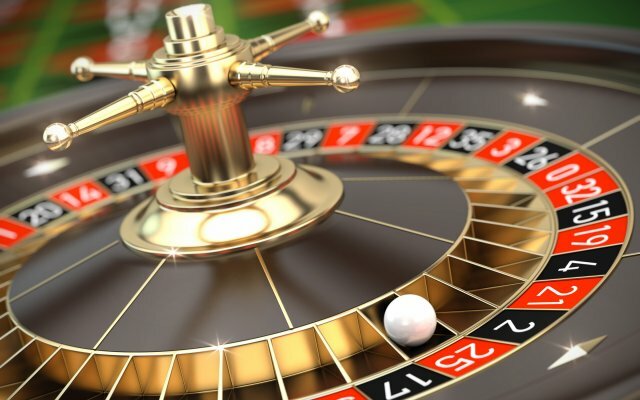 Therefore it is always recommended that you find a European Roulette to play in whenever possible, as it will give you more of an opportunity to win  particularly if you are just starting out! Visit our House Edge page for more figures on the casino advantage for each game. Now that we know how the winning bet is determined and the different types of Roulette you will find, lets go ahead and dive into all the different variety of bets you can make on the board before the croupier spins that wheel. We will base the odds and gameplay on the European version of Roulette, as it will be the most profitable in the long run. Bets are normally divided into two categories: Inside bets and Outside bets. As its name would indicate, inside bets are those placed on the inner part of the board: The numbers themselves. These will give you the biggest payouts in the game, though they are harder to hit. Numbers - Betting directly on a number is also called a straight-up bet. To bet on a specific number, place your chip(s) directly on top of your desired number. While the odds of the ball landing on the number you chose are not great, if lady luck is on your side and your number hits you will be paid an astonishing 35 to 1, meaning you will get £35 for every pound you bet. Splits - By placing chips on the line between any two numbers, bets can be split into two. This will result in a winning bet if the ball lands on either of the two numbers, paying out 17 to 1  essentially halving the payout of betting a single number, while giving you twice the chance to win. Corners - Much like splits, placing a chip on the corner of four numbers will split your wager into 4, paying out at odds of 8 to 1 if any of the numbers lands. This is also effectively the same odds as playing each single number. - Much like splits, placing a chip on the corner of four numbers will split your wager into 4, paying out at odds of 8 to 1 if any of the numbers lands. This is also effectively the same odds as playing each single number. Streets - Another popular wager is to place a bet on an entire row of numbers (Ex. 1, 2, 3 or 25, 26, 27), commonly referred to as a Street. To bet a street place your chip(s) on the left border line of the left number. Streets pay out odds of 11 to 1. Six-Lines  The equivalent of betting two streets at once, betting six-lines allows you to bet on sets of six contiguous numbers at once (Ex. 31,32,33 & 34,35,36). To place a six-line bet, place your chip(s) on the corner of the left border line between the two streets (Between 31 and 34 in the example above). Betting Six-lines pays out odds of 5 to 1. Outside bets, found on the outer part of the board, group multiple numbers together providing much larger coverage on the board, at the cost of smaller payouts. Betting on outside bets normally incurs in less risk and is a safer strategy for those starting out. Even Chance bets  Placing a bet on the ball falling on a Red/ Black number, on the number being Odd/Even, or being Low (1-18)/High (19-36) are all even chance bets. This means that winning bets will pay you 1 to 1, a profit equivalent to your bet amount. Columns - At the far right of the board, you will find the option to bet on all the numbers of a particular column. If a number contained in your column comes up, you are paid at odds of 2 to 1  twice as much as you bet. Dozens  Betting on dozens splits the board into 3. Numbers from 1 to 12 are in the 1st Dozen, 13 to 24 in the 2nd and 25 to 36 in the 3rd. Like columns, bets on dozens will also pay up at odds of 2 to 1. Now that you understand the basic functioning and types of bets you can make in Roulette its time to put your new skills to test. If you are planning to go to a land based casino, we recommend you first watch others playing for a while before you join in, to make sure you understand the dynamic and table etiquette. You can also practice for free by signing up to an online casino and playing for fun until you feel youre ready to give it a spin.